Falcons TTC emerged champions of the inaugural Ultimate Table Tennis after beating table toppers Shaze Challengers 14-9 in the final at the National Sports Club of India in Mumbai on Sunday. Infront of a roaring, jam packed stadium Wu Yang handed Han Ying her first defeat of the tournament to lead the Falcons to the title. The opening match started with Sanil Shetty and Li Ping facing off. It was a hard fought battle which Shetty lost despite coming from behind to hand the first points of the tie to Shaze Challengers. It was all Falcons from there on who put tie after tie to crush Shaz’s morale. 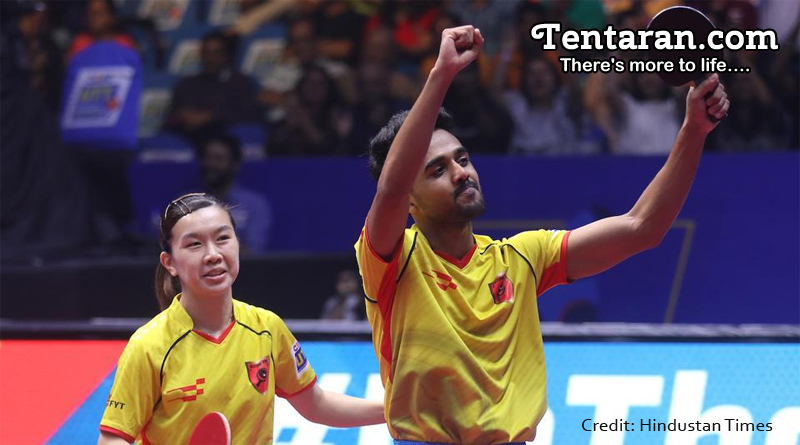 Sanil Shetty and Lee Ho Ching produced the best performance of the night to sweep apart Soumyajit Ghosh and Petrissa Solja 3-0 in the third Match of the Tie. Han Ying secured a thumping 3-0 win over Sutirtha Mukherjee winning 11-4, 11-8 and 11-7. Croatian Andrej Gacina of Shaze Challengers beat Briton Liam Pitchford 2-1 in the men’s singles (foreign player category) which gave Falcons TTC an 8-4 lead. Par Gerell faced Li Ping in the final match. After losing the first Game, Gerell sealed the Tie 14-9 in favor of his team and wrapped up a comprehensive victory for Falcons. Sanil Shetty won the award for the Best Indian Player after his dazzling performance in the final. The newest entrant in India’s franchise sports league, the first season has left us wanting for more. The first season was packed with entertaining moments which clubbed along with performances by celebrities, wide media coverage and huge viewership helped make it a huge success. We will be eagerly waiting for the second season. Till then, it’s adios from us folks! Keep playing!